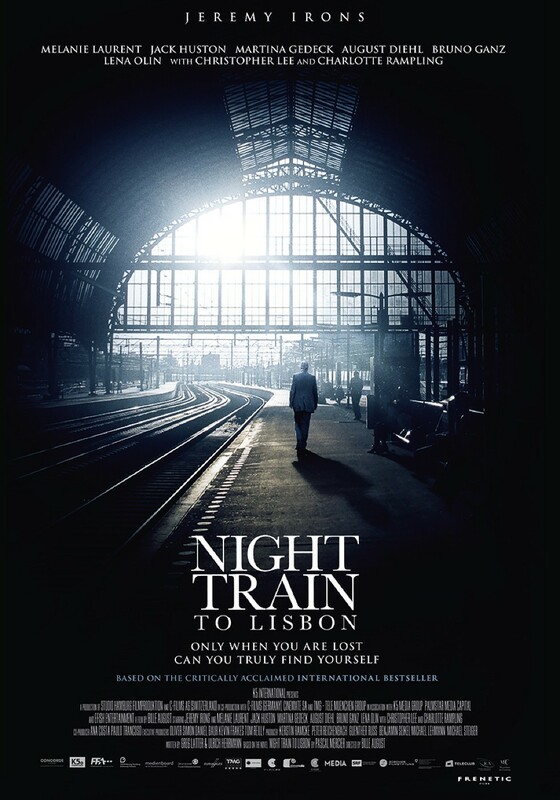 I went to see Night Train to Lisbon without any expectations beside the fact that it has Jeremy Irons as the main character – I don’t know anything about the story line, the director nor any other details. I deliberately avoided any reviews so I wouldn’t be biased in my judgment. The movie is packaged and directed almost classically, focusing on the story and the beauty of the settings – which certainly makes me want to visit Lisbon sometime in the future. Jeremy Iron plays Raimund Gregorius, a lonely professor in Bern, Switzerland who plays chest against himself and has to reuse a used tea-bag from the bin when he ran out of tea. Then one morning as he is walking to work, he spots a young lady wearing a red-coat who is about to jump off a bridge. He manages to save her but before he has the chance to know about her story, she disappears without bringing the coat along with her. In her coat, Raimund finds a book by Amadeu do Prado, and a one-way ticket to Lisbon, leaving very shortly. Then, against his typical nature, he decides to jump into the train and leaves his teaching on pause – tracing the life of the author and how Amadeu’s life is intricately linked with the history of Portugal. We learn that he socialises with the left-wing resistance movement despite his privileged upbringing and how his actions and feelings end up unraveling his friendship. I was skeptical at first when the movie throws some philosophical quotes as Raimund reads the book – I thought that the movie would be a flimsy excuse of a philosophy lecture by the author (I learned afterwards that Peter Bieri (the real person behind the Pascal Mercier pseudonym) is in fact a philosopher). However, as I allow myself to be immersed in the story, I am intrigued with the characters and how they unravel the mystery behind Amadeu do Prado (played by Jack Huston). The movie can be quite awkward at times, especially since the dialogues are all delivered in English – despite the fact that the story takes place in Switzerland and Portugal. Some of the lines are strangely worded – and we get the sense that most of the actors do not speak English as their first language. Perhaps it’s also due to the fact that the original work by Mercier is written in German, and that the director – Bille August – is Danish. However, if you forgive this, to me it adds to the old-worldly charm of the movie. We rarely get to see European movies where the dialogues are delivered in English along with the awkwardness of speaking it as a second language. These days, either they are delivered in the native language(s), or they adopt a strange practice where everybody speaks with generic American accent although the story takes place somewhere else in the world. The end product for Night Train to Lisbon is not quite a ‘foreign movie’ and not quite run-of-the-mill art-house films either – it occupies a space in the middle – similar to Switzerland, I presume! Jeremy Irons manages to inject the gravitas to the acting and provides the anchor in the midst of awkward lines from the other characters. Other established actors like Lena Olin, Charlotte Rampling, Bruno Ganz and even Christopher Lee also contribute to the charm of the movie. I am struck by Tom Courtenay‘s excellent portrayal of João Eça – one of Amadeu do Prado’s comrades – in his latter years. Such great delivery and acting – of a man who was an idealist when he was young but broken by time and the oppressors and still in search for the lost friendships of his youth. Night Train to Lisbon is a revelation to me – it has faults but its charms far outweigh the awkwardness and old-fashioned sentimentality. One quote from the movie that resonates with me from the movie is this: “We leave something of ourselves behind when we leave a place. We stay there, even though we go away … and there are things in us that we can find again only by going back there.” It is mentioned several times in the movie – and when I heard it the second time nearing the end of the movie, it managed to affect me emotionally as somebody who loves to travel and explore. I have left pieces of my psyche in so many places in the world that I would love to find again, given the time and opportunity.